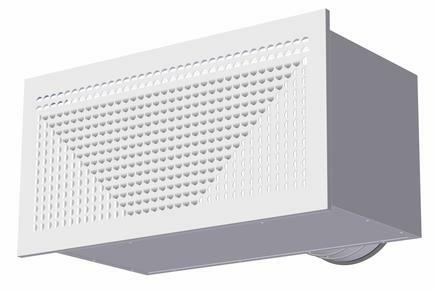 TLK is a rectangular supply diffuser for wall mounting, and is ideal for office premises requiring rear-spigot air connection. With a choice of front panels, most room types can be supplied with a flow pattern adapted to size, width, interior, lighting etc. The TLK comes with a choice of three removable front panels - two with LØV perforation for short and long throw length (K and L), and one with Opus nozzles for variable flow pattern (V). 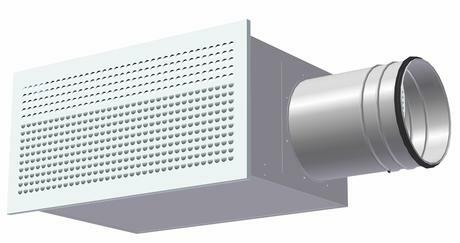 With an adjustable mounting frame between the box and the front, the system can be adapted to the thickness of the wall. The box is equipped with removable damper, measuring outlet and a sound absorber in polyester. Available with rear spigot. The K and L type front panels are made of steel with a RAL 9003 - gloss 30 finish. Other colours are available on request. The V type diffuser front features Opus nozzles in ABS plastic, is made of steel and comes in a RAL 9003 - gloss 30 finish. Other colours are also available, but without the adjustable nozzle option. 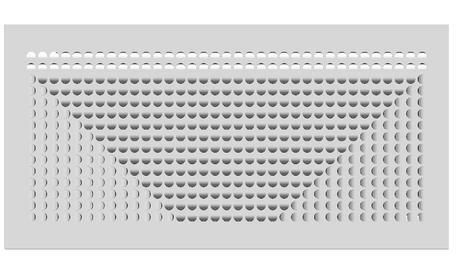 The box is supplied in a galvanised finish, and is internally lined with sound absorber in polyester. EPDM rubber gasket on connection collar. The box is to be fitted in the groove and screwed to the studding. Then the adjustable mounting frame is to be slid into place and screwed to the box. Finally, the front panel is to be eased into position.